Wouldn’t you like to say “YES” to your lover in an atmosphere feeling like on the ground of the deep blue sea while hundreds of coloured fishes are dancing around you in the world’s biggest LOVE Aquarium? A special wedding table will be prepared for the symbolic or civil wedding ceremony in the special underwater cave of the aquarium. It will be decorated with ivory coloured chiffon and lace. A runner will be laid on the table and it will be decorated with artificial flowers. Ring pillow in decoration colour will be prepared. 2 artificial flower arrangements on high metal stands will be placed on the left and right of the table. 4 artificial flower decorations on high metal stands, decorated with ivory coloured chiffon bow- ties will be set up at the bridal walking way. Exclusive professional photographer takes 250 to 500 photos in JPEG Format. (CD with unrevised photos will be handed out! 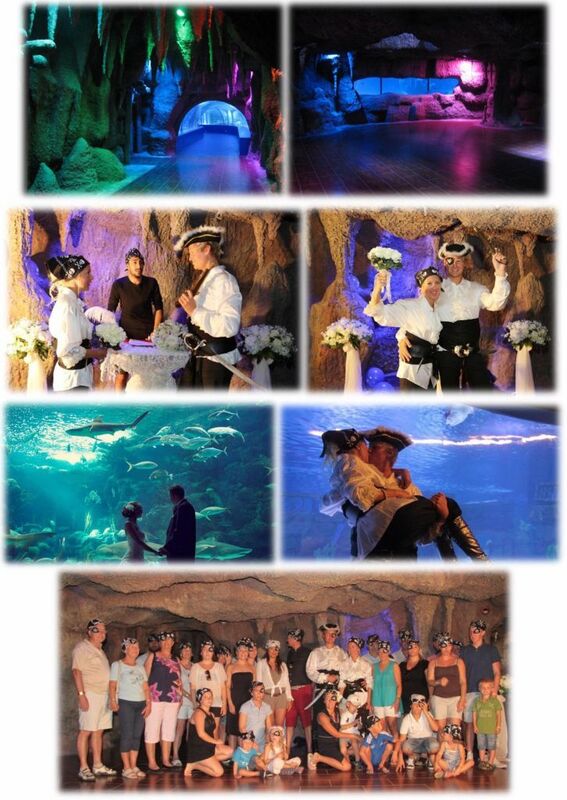 )Bride and groom can have a special photo shooting in special pirate costumes in front of the pirate ship wreck. An English speaking member of our Team (wedding consultant) will assist the couple during the day.